I don't know about you, but I love holiday traditions! My husband and I grew up with so many fun traditions, it was honestly kind of hard to choose which ones to carry on with our own children. However, one of his traditions was getting pajama's every year and a new Christmas ornament. 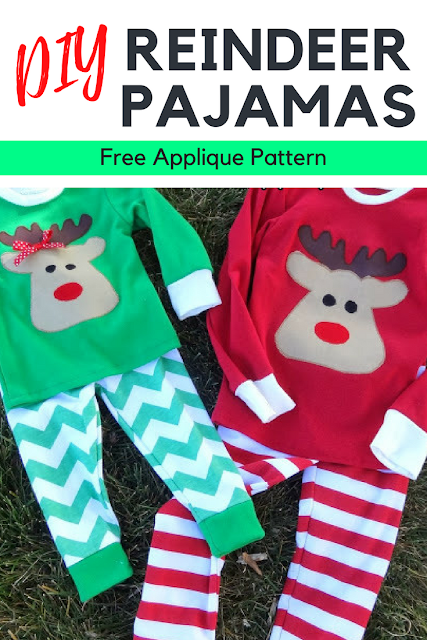 I love both of these ideas, so we have implemented them into our own family traditions and started with these DIY Christmas pajamas with reindeer applique. Now as you can see, I have a boy and a girl. My baby girl is a redhead. So putting red on her tends to wash her out and since it is Christmas, my color choices are a bit limited. So I was looking for something green for her. Luckily I was able to find this fun green and white chevron knit fabric. It worked perfect for her reindeer applique pajamas. For my son, I went with red. Christmas red to be exact and love how it came out. He has a great skin ton and most bright colors look really nice on him. Plus, he does like red (mostly orange, but also red). To tie the two kids pajamas together, I wanted to add a fun Christmas image on the front. So I went with the reindeer. 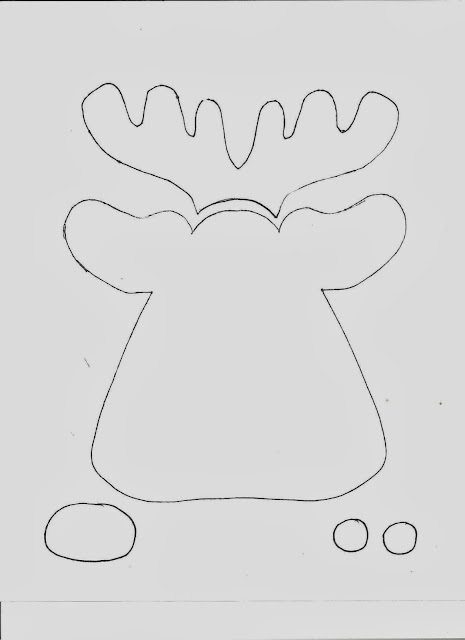 I couldn't find exactly what I wanted online, so I put together my own reindeer pajama template. I did have to shrink the size of the reindeer for my daughter, but it worked out well. And you can download it for yourself! Above is the adorable reindeer pajama applique pattern. If you click on the picture, it will take you to the pattern in Google Docs and you can print. Or just click HERE. Once you have printed, then you can follow THESE instructions to apply your reindeer applique to your reindeer pajamas and then make sure you stitch down the applique or when you wash them it'll come right off. I LOVE these pajamas. In fact, it'll be hard to beat them year after year. They turned out so great and the kids love them. How about your family? Do you have fun traditions for the holidays? I'd love for you to share them with me in the comments! Or join our Facebook group and share your creations.